Blu-Ray Review | "The New World"
Like most of Terrence Malick's filmography, The New World is a film whose beauty often defies words. 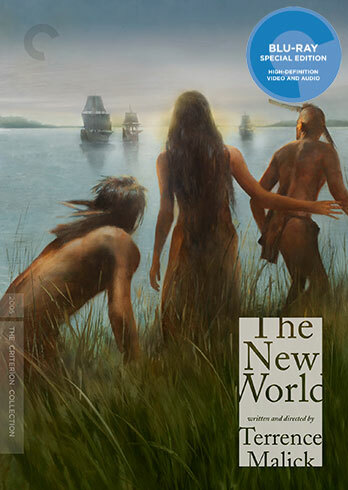 It doesn't matter if you watch the more streamlined theatrical cut or the more abstract extended cut, The New World is a monumental work in any form. While Malick cut down the film for its theatrical release, the extended cut almost feels like a different film entirely - more loose, more elliptical, more in line with Malick's more recent works like To the Wonder and Knight of Cups. All three versions of the film, the first cut, the theatrical cut, and the final extended cut, are all included on Criterion's sumptuous new Blu-Ray package, which also includes and informative comparison of all three cuts. Still, there's more of a plot-like structure here than there is in his later work, and The New World may mark his finest balance between plot and abstraction. Perhaps it is because the story he tells here is so familiar. The story of Pocahontas has been a part of American lore for centuries - the Native American princess who fell in love with John Smith, saved him from being executed by her father, and went on to marry John Rolfe before dying in England, a world away from her pristine homeland of what is now Virginia. You can almost divide the film into two parts. The first half is about discovery - of a new world, of a new love, of one's self. It is awash in wonder and beauty (made even more breathtaking in its new 4K restoration on the Blu-Ray), and the heart-pounding, breathless yearning of first love. The second half is about disillusion, the death of innocence, and ultimately, the discovery of a new kind of love, less about unbridled passion and more about stability. Some may call the "settling," but Malick passes no such judgements here. Malick is the great cinematic observer, a poet-philosopher whose vision is presented through questions, musings, and a never-ending search for answers, both earthly and divine. As is typical of Malick, the central love stories, between Pocahontas and Smith, then Pocahontas and Rolfe, are much more than they appear to be on the surface. Malick has constructed them as metaphors for the discovery of America - from its initial, untouched promise, to "destruction of Eden" that marks the end of the Natives' idyllic paradise, to the eventual acceptance of a new way of life, one that is not necessarily bad, but not as good as what came before. In a sense, The New World is a deeply American love story, in which America is the object of desire. It is at once an elegy and a romance for a bygone world, one whose ramifications echo into our own world still today. Malick has much to say about the nature of love and desire here. But he also has a great deal to say about the nature and origins of America. Don't expect a political screed - Malick is far too lofty a filmmaker to sully himself with such mundanities. No, Malick reaches for the heavens, for an ideal. The New World is a search for the American soul, and we are still searching for it today. In today's heated political climate, it is a film that feels all the more vital - a probing, lyrical exploration of what makes us, as humans, as Americans, as inhabitants of this mortal plane, who we are. Now available on Blu-Ray and DVD from The Criterion Collection. Blu-Ray Review | "Chimes at Midnight"
Blu-Ray Review | "Mountains May Depart"
Review | "Our Little Sister"